When looking for a firearm accessory such as a firearm cleaning kit and rifle scope it is the quality that you need to consider in the first place. A product that has a good quality is something that you can actually rely on in many ways. 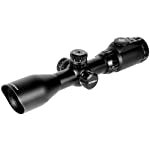 Burris Scout 2-7 x 32 Ballistic Plex Scope. This product is made using the highest quality materials for complete quality and reliability. It comes with an eye relief of 9.2 to 12 inches and the unit is completely resistant to fogs, water and shock. UTG 2-7X44 30mm Long Eye Relief Scout Scope. This comes with an imported quality and unlike the first option, this one comes with a myriad of features to boast: emerald lens coating, shockproof, fogproof, rainproof, integral sunshade, six mil dot etched glass reticle, zero locking and zero resetting, 36 color modes and many more. Leupold FX-II Scout 2.5x28mm Duplex. This product is also teeming with features like the first two options we have. Basically, this scope is simply built for abuse and you will definitely get the drop of whatever you are hunting guaranteed. It comes with a super long 9-17” eye relief, a patented multi-coat four lens system, a dependable reticle, click adjustments and more. Price is another important factor that affects a buyer’s decision. So, when buying something such as accessories for your AK 47 or Ruger rifle, it is important to consider the price tag of a particular product first. This proves to be true when you are looking for the best scope for Ruger Gunsite Scout RifleB245. Burris Scout 2-7 x 32 Ballistic Plex Scope. This one happens to be the most expensive on our list. But considering its fine qualities and features, this scope proves to be an excellent find in case you are willing to shell out more money for a rifle scope. It comes with price tag of more than three hundred and fifty bucks. UTG 2-7X44 30mm Long Eye Relief Scout Scope. Compared to the two other options we have on this list, this one from AccuShot happens to be the one that has the lowest price. Priced at less than two hundred bucks, this scope proves to be a very practical option considering myriad of features it has to offer. Leupold FX-II Scout 2.5x28mm Duplex. The price of this scope is basically second from the highest and second from the lowest; in short, its price is in the middle compared to our first two options. Tagged at a price of just a bit more than three hundred bucks, this scope happens to be a perfect find considering its appealing looks, nice features and reasonable price. Any product that is extra durable is worth buying for. This is something that you need to keep in mind when dealing with different choices of scopes on the market. But since we had your choices simplified, you just need to compare one after another here using all the criteria we have and these include durability. Burris Scout 2-7 x 32 Ballistic Plex Scope. 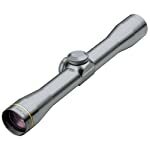 This scope is made using the finest and high quality materials so you can rely on its full quality and reliability. UTG 2-7X44 30mm Long Eye Relief Scout Scope. Compared to our first option, this scope is tagged as imported and offers a myriad of features that spell out its sense of durability and longevity. These features include the following: shockproof, waterproof and scratchproof. Leupold FX-II Scout 2.5x28mm Duplex. Unlike the first two scopes that we have on our list, this product has a lot to offer as far as durability is concerned: fogproof, waterproof, absolute recoil resistance even with large scale calibers and repeated accuracy, and incredibly durable construction. Does the scope you are eying on look attractive? If it does then how does it perform? Does it suit your needs and expectations? When looking for the best scope for Ruger Gunsite Scout Rifle, performance is another important thing that you need to consider. Burris Scout 2-7 x 32 Ballistic Plex Scope. 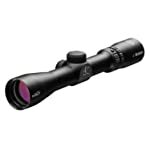 This product comes with high quality glass and index-matched multi-coatings that keep it on the leading edge of scout scope technology. UTG 2-7X44 30mm Long Eye Relief Scout Scope. If our first option got what it takes to be on the leading edge of scout scope technology, our next product has the following to boast in terms of its overall performance: up to 11″ Long Eye Relief, TS Platform, EZ-TAP Illumination Enhancing 36-Color Etched Glass Mil-dot Reticle, Multi Emerald Coating, Zero Lock/Reset W/E, SWAT AO, RG2W3154 Max Strength QD Rings & \Flip-up Lens Cover. Leupold FX-II Scout 2.5x28mm Duplex. This product have the following that you may not find on our first two options: Patented Multicoat 4 lens system for superior light transmission capability, anti-glare interior work together to give you a crisp, vivid sight picture without equal, generous 22′ F.O.V. at 100 yards, 1/4 M.O.A. click adjustments, Classic, dependable duplex reticle, 9-17 inches non-critical eye relief and more. See to it that when looking for a scope for your rifle, the product should not only be high in quality, durable, affordable and high in performance. It should also be user-friendly. Burris Scout 2-7 x 32 Ballistic Plex Scope. 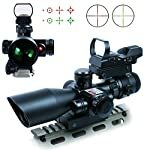 With the simplicity of this scope, rest assured that you can easily make use of it in all of your firing and shooting endeavors without the hassle. UTG 2-7X44 30mm Long Eye Relief Scout Scope. This product comes with many features and for sure, it may take a good amount of your time rehearsing and mastering the functionalities of this scope. Leupold FX-II Scout 2.5x28mm Duplex. Like our first two options, this scope is also teeming with many features and functionalities that need to be thoroughly practiced and understood. But even when you practice and use all functionalities quite often, rest assured that this friendly scope is simply made for abuse and that is its big winning edge. Basing from our comparison and the criteria used in assessing and evaluating each option, it is obvious to note that the Leupold FX-II Scout 2.5x28mm Duplex happens to be the best scope for Ruger Gunsite Scout Rifle for you.